MENLO PARK, CA--(Marketwired - Dec 10, 2016) - Corcept Therapeutics Incorporated (NASDAQ: CORT), a pharmaceutical company engaged in the discovery, development and commercialization of drugs that treat severe metabolic, psychiatric and oncologic disorders by modulating the effects of the stress hormone cortisol, released efficacy data today from its Phase 1/2 trial of mifepristone to treat patients with metastatic (TNBC). The data were presented at the 2016 San Antonio Breast Cancer Symposium. "The results of this trial support our hypothesis that cortisol modulation augments the benefits of chemotherapy in solid-tumor cancers that express the glucocorticoid receptor (GR)," said Joseph K. Belanoff, MD, Corcept's Chief Executive Officer. "As we have mentioned before, we are excited to report that investigators at the University of Chicago are leading a multi-center, placebo-controlled, Phase 2 trial of mifepristone in combination with nab-paclitaxel (Abraxane®) to treat patients with advanced TNBC." "Our oncology program continues to gain in depth and breadth," said Robert S. Fishman, MD, Corcept's Chief Medical Officer. "The Phase 1/2 trial of our proprietary cortisol modulator, CORT125134, continues to progress. Next year we plan to study this compound's efficacy, in combination with Abraxane, as a treatment for patients with TNBC and ovarian cancer. Early next year, we will also advance to the clinic the selective cortisol modulator, CORT125281, which has shown great promise in animal models of castration-resistant prostate cancer (CRPC). Our study of selective cortisol modulators fits well with the important work with mifepristone being performed by University of Chicago investigators, who are leading a multi-center, double-blind, controlled Phase 2 trial of mifepristone plus enzalutamide (Xtandi®) in CRPC and are leading, as Dr. Belanoff said, a multi-center, placebo-controlled Phase 2 trial of mifepristone in combination with Abraxane to treat patients with TNBC." This open-label trial was designed to investigate whether the addition of mifepristone enhances the effect of eribulin (Halaven®) in patients with TNBC whose tumors express GR, one of the receptors to which mifepristone binds. The trial studied 21 patients with GR positive tumors, one with a GR negative tumor and one whose GR status is not known. As determined using the Response Evaluation Criteria in Solid Tumors (RECIST), efficacy results in this group were as follows: Four patients exhibited a partial response, defined as a 30 percent or greater reduction in tumor size, eight had stable disease and 11 had progressive disease. One patient (who has exhibited a partial response) continues on therapy (see Figure 1). "These data are encouraging," said Dr. Fishman. "Six patients achieved progression-free survival (PFS) longer than the upper bound for PFS (15 weeks) in patients receiving Halaven monotherapy in a comparable population (Aogi et al., Annals of Oncology 23: 1441-1448, 2012). 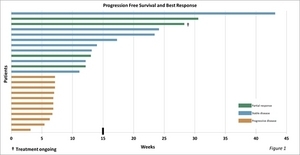 Median PFS in our trial was 11.1 weeks -- compared to 7.2 weeks in the Halaven monotherapy study reported by Aogi. We continue to collect overall survival data. Eight study patients are known to be alive." TNBC is a form of breast cancer in which the three receptors that fuel most breast cancer growth -- estrogen, progesterone and HER-2 -- are not present. Because the tumor cells lack these receptors, treatments that target estrogen, progesterone and HER-2 are ineffective. Approximately 40,000 women are diagnosed with triple-negative breast cancer each year. It is estimated that more than 75 percent of these women's tumor cells express GR. There is no FDA-approved treatment and neither a targeted treatment nor an approved standard chemotherapy regimen for relapsed triple-negative breast cancer patients exists. Corcept has licensed patents from the University of Chicago covering the use of GR antagonists in combination with chemotherapy to treat TNBC and castration-resistant prostate cancer. Castration-resistant prostate cancer (CRPC) is a form of the disease that progresses despite androgen receptor blockade. There are approximately 130,000 patients with metastatic CRPC in the United States. The prognosis for patients with metastatic disease is poor. Mifepristone is the active ingredient in Corcept's product, Korlym® 300mg tablets, which the FDA has approved for the once-daily oral treatment of hyperglycemia secondary to endogenous Cushing's syndrome in adult patients with glucose intolerance or diabetes mellitus type 2 who have failed surgery or are not candidates for surgery. Korlym (mifepristone) ameliorates the symptoms of Cushing's syndrome by modulating the activity of cortisol at GR, one of the two receptors to which cortisol binds. Korlym was the first FDA-approved treatment for that illness and the FDA has designated it as an Orphan Drug for that indication. Corcept is a pharmaceutical company engaged in the discovery, development and commercialization of drugs that treat severe metabolic, oncologic and psychiatric disorders by modulating the effects of cortisol. Korlym (mifepristone), a first-generation cortisol modulator, is the company's first FDA-approved medication. The company has a portfolio of proprietary compounds that modulate the effects of cortisol but not progesterone. Corcept owns extensive intellectual property covering the use of cortisol modulators, including mifepristone, in the treatment of a wide variety of serious disorders. It also holds composition of matter patents covering its selective cortisol modulators. Statements made in this press release, other than statements of historical fact, are forward-looking statements. These forward-looking statements, including statements regarding the timing of clinical trials and clinical trial results, are subject to known and unknown risks and uncertainties that might cause actual results to differ materially from those expressed or implied by such statements, including the pace of enrollment in or the outcome of the Corcept's Phase 1/2 study of CORT125134 to treat solid-tumor cancers and clinical trials being undertaken by academic investigators at the University of Chicago, the pace of enrollment the effects of rapid technological change and competition, the protections afforded by Corcept's intellectual property rights, or the cost, pace and success of Corcept's other product development efforts. These and other risks are set forth in the company's SEC filings, which are available at the company's website (corcept.com) or from the SEC's website (sec.gov). Corcept disclaims any intention or duty to update any forward-looking statement made in this press release. Abraxane® is a registered trademark of Celgene Corporation. Halaven® is a registered trademark used by Eisai Inc. under license from Eisai R&D Management Company, Ltd. Xtandi® is a registered trademark of Astellas Pharma Inc.